Cheers to the arrival of Spring – a season full of hope, growth, and new beginnings. 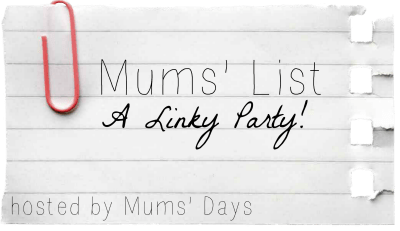 Intrigued by the Mum’s List Linky Party, I’m trying something new and joining the Linky Party (who doesn’t love a party?) by writing my own Mums’ List recap of the week. This week we saw new life growing before our eyes as the tomato and herb starts we planted a short while back sprouted with pride. 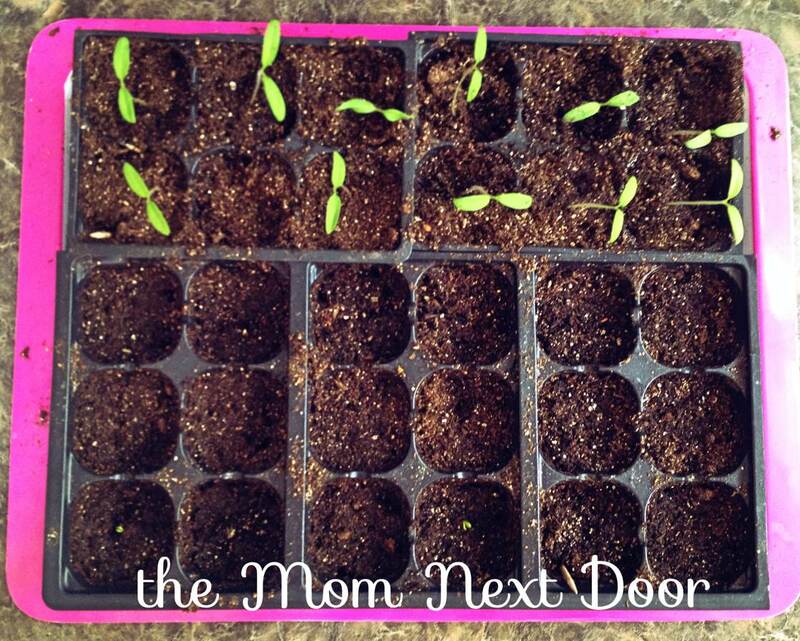 My little sprout was delighted to see the tiny plants grow before her eyes. My husband and I started a healthy new routine of running after work. Its the first thing we do after work – we load up the kids in our double jogging stroller and go for a run together…well, more of a jog at this point but its a good start. I feel better, I sleep better, and its proven to be a wonderful way to clear my head from the stress of the day. I enjoy spending the time together as a family. It also gives my husband a rare opportunity to talk to me without being interrupted – I can barely breathe while we run, talking and interrupting just isn’t possible. Our baby boy reached the new milestone of saying words, and it warms my heart to hear him say “mama” and “mummm”. Special thanks to my husband (a uniquely wonderful stay-at-home dad) for capturing the moment on video and sending it to me while I was at work this week. This week I made a new commitment to include an image in every post: its more interesting for readers, posts with images receive more traffic, a great image makes a great pin, and pinned posts reach a larger audience. Fellow Pinterest addicts can follow me here. Lastly, I made a new post, playing with food is fun, to my blog this week…because life is a party and PB&J doesn’t have to be so boring. And that concludes what I hope to be the first of many Mum’s List weekly recaps. Cheers to all, and hello spring! Yey!! Welcome aboard! I’m so pleased you chose to link in for Mums’ List 🙂 What an honour! Looks like you’ve had a great week – I need to check out your post about playing with food…might encourage Reuben to try some new things! Also, well done on starting your new healthy routine (you know what they say about couples who run together, right?? 😉 ) and I totally agree about doing images for each blog post, that’s been an aim of mine too, to make more images especially with pinterest in mind. I don’t always manage it though! I presume you’ve tried picmonkey? It’s changed my life!! Thank you! I enjoyed doing the Mums’ List and I’m still in the process of reading the other articles that joined, it’s fun to see what other mums are up to. The picture thing was probably common sense to other bloggers but it was a fun realization for me. I love photography and blogging has encouraged me to play with it. Maybe next week I’ll join in in the Silent Sunday fun, I love the picture you posted. Meanwhile I’ll have to check out picmonkey. Hi! I found you through #MumsList and it’s funny that for the last week, Andrew and I have also been going out in the evening (for a stroll, not a run … yet) and even from a mental health point of view I think it is doing us the world of good. I’ve set myself a challenge to do at least one 10 mile walk a week with the pushchair; I did 9.5 yesterday although I do worry that Gwenn is finding it all incredibly dreary. Hi! Yes there’s definitely a mental health benefit to walking or running. Good for you making a goal to do a 10 mile walk, that’s a long walk! It may get dreary for the kids, but it sets a really good example for them of taking good care of yourself. I often bring a sucker or treat to give my daughter about half way through our longer walks. We talk a lot about our surroundings as we walk, but I have a hard time entertaining and talking to her when I run because I can barely breathe! Thanks for the comment. Yes I’m proud and it melts my heart every time I hear William say mama. Whenever Thomas says it for the first time, you’ll find it’s well worth the wait!